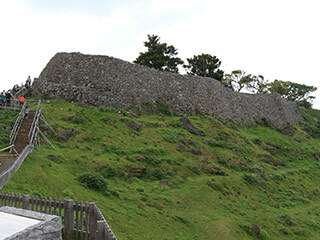 Nakijin Castle (今帰仁城) is one of the oldest castle in Okinawa. It was constructed in 13th century. It is a large hilltop castle with many large stone walls. The stone walls and baileys are remaining in great conditions. It is registered as the UNESCO World Heritage Site. This castle was ruled by Hokuzan Kingdom before Ryukyu Kingdom. It is 350m long and 800m wide castle and the largest castle in Okinawa. Admission: 400 yen for adult, 300 yen for under high school. 0. at Naha Bus Terminal. 1. use Yambarubasu to Nakijingusukuiriguchi. Built in: 13th century by King Hokuzan. Nakijin Gusuku is ruins of hilltop castle located in Nakijin Village, Okinawa Prefecture. It was constructed in 13th century by King Hokuzan for his castle. It has 7 baileys and the size is 350m long that makes it 800m wide castle and the largest castle in Okinawa. This castle was attacked by King Shohashi of Ryukyu in 1416 and defeated by him. Then this castle was used for the castle of Ryukyu to protect northern region. Mentioned in a Chinese hisotry book from the 14th century are 3 northern kings from the Ryukyu Kingdom; Hanji, Min and Hananchi. On Okinawa Island during this period, there were three principalities, Hokuzan of the northern region, Chuzan of the central region, and Nanzan of the southern region. Based at Nakijin castle the king of Hokuzan controlled most of the northern reaches of Okinawa Island, and traded independently with China. However, the history of Hokuzan came to a close in 1416, when the principality was conquered by Kin Sho Hashi of Chuzan. It is said this area was sued to raise and train horses in preparation for battles. It is surrounded by the hightest stone walls, making it a solid and robust bailey. About 2m in height, the comparatively lower stone walls of the outer bailey winds over a length of several hundred meters. Here, remains of a residence were confirmed in a excavation survey. This main gate was restored in 1962, during the age of the Ryukyu Government. Transition periods from the construction to abandonment of the gusuku were identified through excavation surveys. This is where the main gusuku structures stoods. It is believed that closest subjects serving the master of the gusuku resided in this aera. Because of its historical vale, it is registered as Gusuku Sites and Related Properties of the Kingdom of Ryukyu of UNESCO World Heritage Site and the national historic site.